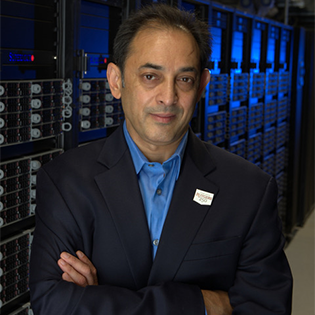 Dr. Parashar served as Program Director in the then-Office of Cyberinfrastructure (OCI) at NSF between 2009 and 2011, managing a research portfolio that spanned software sustainability, computational and data-enabled science and engineering, and cloud computing. Among his accomplishments was leading the establishment of the crosscutting Software Infrastructure for Sustained Innovation (SI2) program. Dr. Parashar holds Ph.D. and M.S. degrees in computer engineering from Syracuse University and a B.E. degree in electronics and telecommunications from Bombay University (India). He has received numerous honors throughout his career, including a 2013 R&D 100 Award (with ORNL and the Georgia Institute of Technology), the Peter D. Cherasia Faculty Scholar Award from the Rutgers School of Engineering (2014-2017), IBM Faculty Awards in 2008 and 2010, the Tewkesbury Fellowship from the University of Melbourne (Australia; 2006), and the Rutgers Board of Trustees Award for Excellence in Research (2004-2005). He was elected to the Institute of Electrical and Electronics Engineers (IEEE) Computer Society’s Golden Core in 2016; is a Fellow of the American Association for the Advancement of Science (AAAS) and IEEE; and is an Association of Computing Machinery (ACM) Distinguished Scientist.